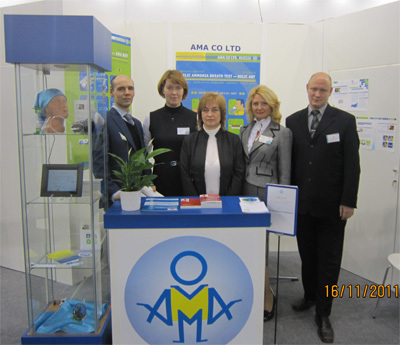 It was outstanding sole global yearly event the MEDICA Trade Fair in Düsseldorf, Germany, November 16-19. This year the AMA`s delegation was more large and mobile to visit as many desired expositions as it was possible in the course of MEDICA work. Besides the different kinds of exhibitor`s activity participants of AMA`s delegation had managed to conduct very important coversations and to achieve the basic agreements with potential european distributors. As usual, all visitors and passersby experienced an attraction to vivid show namely the live demonstration of Helic Ammonia Breath test procedure at the AMA`s booth. 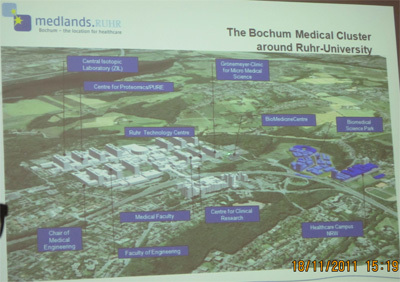 The new usefull impressions and the new ideas have appeared as the result of the excursion to the Biomedical Cluster of Bochum, North Rhein-Westfalia. The main task after MEDICA is development of the capital we have got!